Alyssa Hughes was rocking back and forth to an impromptu band. Behind her, Martell Henry-Wilson set a beat for the group, drum pumping clear and sharp through the space like a heartbeat. Jonathan Triplett and Danny Peters joined on keyboard, working out a quick, clean staccato. Hughes twisted a little at the waist, bobbed her head. She came to the lip of the stage and brought the mic to her mouth. 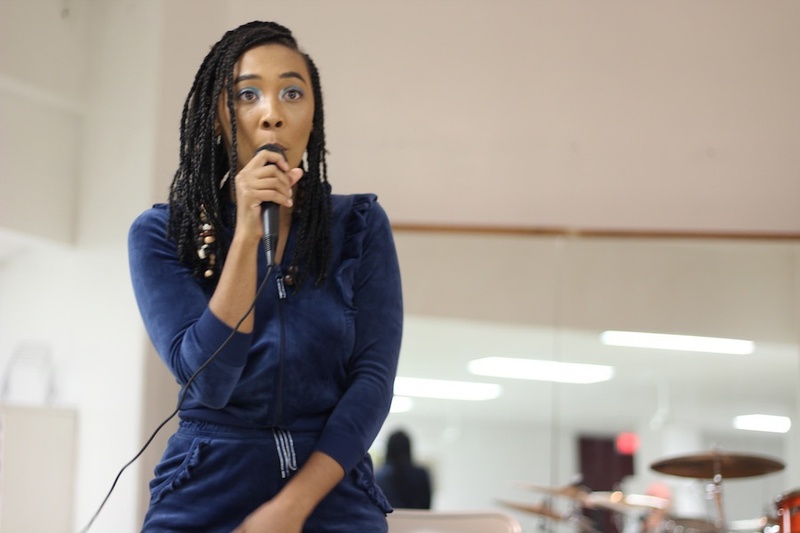 Saturday evening, the Waterbury-based musician was one of several performers at “Home Is Where The Art Is,” an exhibition, concert, and fundraiser to fight homelessness in New Haven. 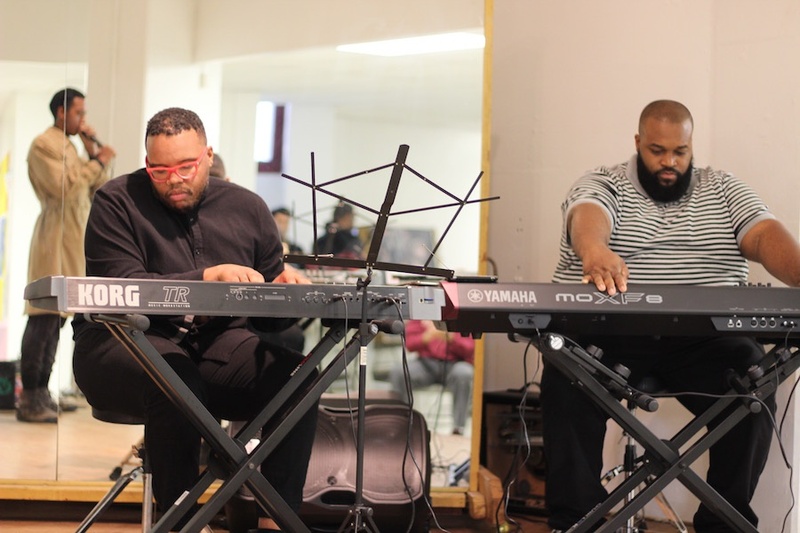 It was held in the basement of Dixwell Avenue Congregational United Church of Christ, which hosted the even as part of its three years of celebration leading up to its bicentennial in 2020. Six months after an initial art show at Musical Intervention, the series returned as a collaboration between The Lineage Group’s RevA.A.R.T.lution (Altruistic, Ancestral, Renderings Of Truth) initiative and the church’s Missionary Weekend board, part of its 200th anniversary celebrations. It was curated by RevA.A.R.T.lution artist Steve Nardini and church member Allison Brown. Around the room, attendees took time to peruse handmade jewelry, painted t-shirts, bright oils and pen and colored pencil drawings that lined tables and dotted the walls. From the back of the space, the smell of rice and peas and vegan Jamaican food mingled with chocolate chip cookies and a bowl of oranges. At the front, a band jammed onstage. Artists arranged their tables around the edges, walking around as a rotating cast of artists took the stage. 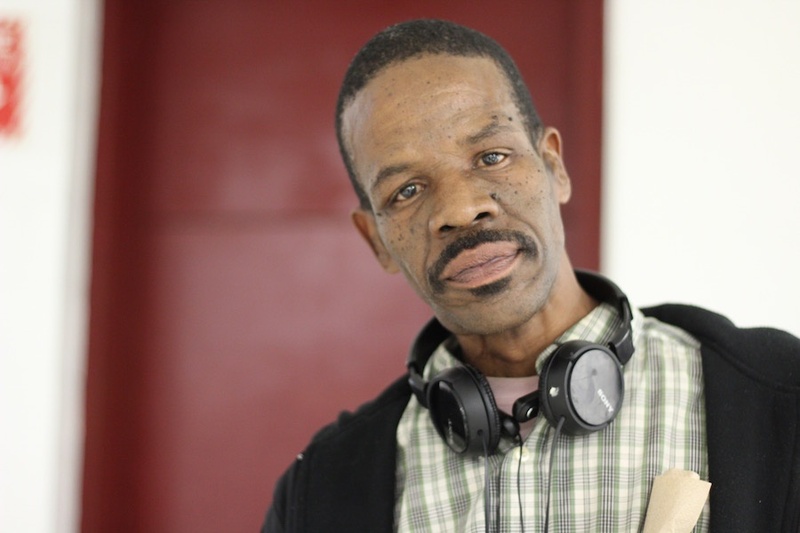 At one, New Havener Isaac Canady (pictured above) told his life’s story as viewers pored over his work, occasionally stopping him to ask for prices. A self-proclaimed street artist—he shows largely outside of the Starbucks on Chapel— Canady was born and raised in New Haven, growing up on Kensington Street in the city’s Dwight neighborhood. His childhood was molded by lessons at the legendary Bowen-Peters School of Dance, where he studied intermittently for several years until he was thrown out for skipping out on recitals. In a way, he said with a grin, it was the unexpected push into visual art that he needed. He loved dance. But after leaving Bowen-Peters, he realized he loved art even more. By the 1990s, he loved it enough for it to save his life. In 1992, he left his family and baby daughter for Maine, seeking treatment for a serious crack addiction. While in a psychiatric hospital there, he started playing with pen-and-ink pointillism, integrating it into his work before he had ever heard of the artists who made it famous in nineteenth-century France. When he returned to New Haven in 1994, he continued making his art, finding joy every time he returned to his sketchbooks. When Canady returned from Maine, he worked for the state of Connecticut for several years, ultimately quitting to pursue visual art full time. He had some success—he has made and sold work at the Starbucks Coffee on Chapel Street, where he met Nardini and his mother earlier this year. But he has also struggled with homelessness on and off for 15 years. While he rarely exhibits his work, he said he was excited to be a part of “Home Is Where The Art Is” because it was a space for social gathering. Beside him, several untitled works glinted in their laminated covers. In one, roots hung limp and jellyfish-like in a sea of green and brown shapes, bulbous and gathering as they reached upward. Above a midpoint, they exploded again in tentacles, snaking over the top of the work. In the backdrop, yellows, greens and reds bled together, prismatic as they cut through the work. Back onstage, Kaïna Mondesir had gotten the audience into a groove with a cover of Nina Simone’s “Baltimore,” subbing the words “New Haven” at the chorus as she half-sang, half-asked the audience Ain't it hard just to live? At the back of the room, artist and “church member since birth” Dena Donaldson let the words coast over her. After hearing about the event from other members of the church, she said she had been excited to participate, handing out flyers to get the word out in the Dixwell community. 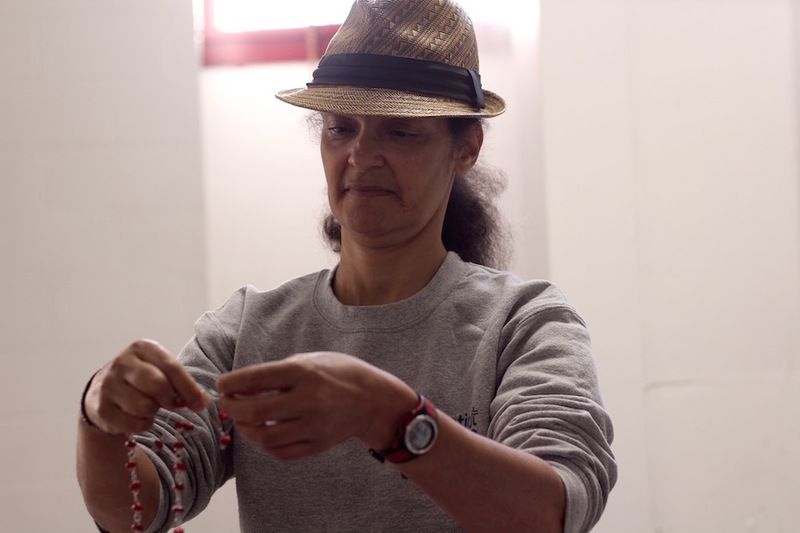 So did Sonia Alvarez (pictured above), a retiree who lives in Bella Vista, and said that making jewelry helps her control her epilepsy. While she joked that she’d been talked into the event—Brown is her daughter—she added that she'd been pleasantly surprised as attendees stopped to look at her brightly beaded necklaces and earrings. Later in the evening, her surprise doubled as the audience sang "Happy Birthday" and presented her with a double chocolate cake. Up front, the audience filled with a few new members. Mondesir gave the mic to co-organizer Allison Brown, who told the audience that she had prayed about the event. 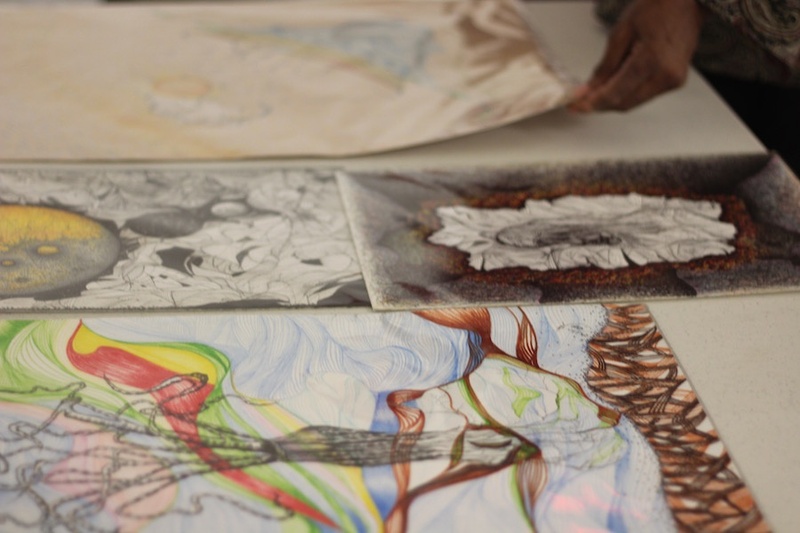 In April, Brown attended the first “Home Is Where The Art Is,” and wanted to become part of the efforts to counter homelessness with art in New Haven. She quoted James 2:1-4, her voice lifting up to the ceiling as she spoke. Then she looked around, handed off the mic to spoken word artist Myles White like a relay baton, and let the show unfold. For more from the event, click on the video below or check out The Arts Paper at @newhavenarts on Instagram.